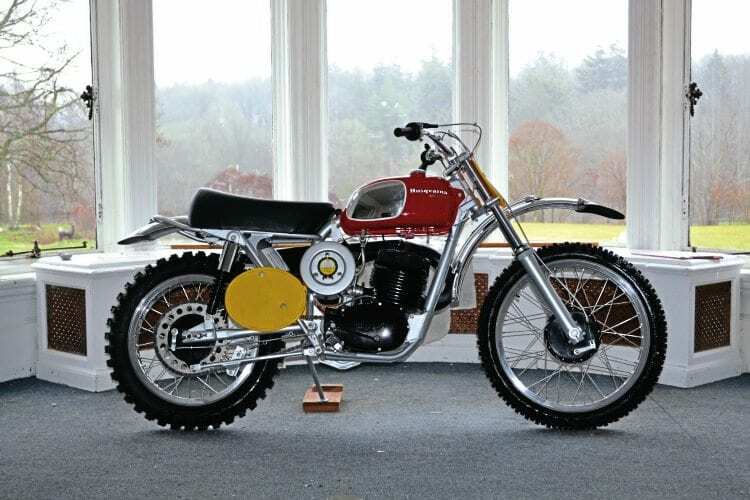 When it came to teaching the MX world a lesson, Husqvarna’s 400 Cross was top of the class. Looking at Will Bennett’s bike again, after its Stafford-winning appearance, it was clear this was still a superb machine. A photoshoot planned for December is fraught with difficulty, the weather being the major problem as it could be so bright as to make photography difficult, so cold as to make standing around uncomfortable or, as in this case, so wet and miserable we nearly had to call the whole thing off. It didn’t help that the weather forecast was telling us it was clear and bright in Kent. in the van while we went to make our presence known to the school office. Following the principle of nothing ventured nothing gained, I asked if there was a possibility of doing the shoot inside the school… which is how we ended up wheeling a Swedish motorcycle through the halls of an English prep school. Will looked on incredulously as I waffled on about light and contrasts with the pastels of the room enhancing the red, silver and black scheme of the 400 Cross. I could tell he wasn’t convinced, but he mellowed when he saw the photos. Looking at this 400 Cross, it is hard to believe it didn’t start out as a complete bike. The bare bones were there – rolling chassis and engine, or most of the engine anyway – but there were a lot of parts to source. “That is the bit which really took the time,” says our man, “I was determined to find the correct bits to make the bike as catalogue as possible, if I’d been building it to ride then this would have been of less concern, but I’ve another Husky to race.” It was then he admitted he’d been smitten by the 400 Cross since seeing a scale model kit of one when he was young. “I’ve become a bit of an internet auction site hound,” he grins, as his phone bleeped with warnings of parts auctions coming to an end.